Plants annual. 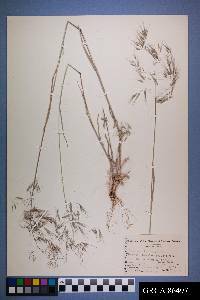 Culms 5-90 cm, erect, slender, puberulent below the panicle. Sheaths usually densely and softly retrorsely pubescent to pilose, upper sheaths sometimes glabrous; auricles absent; ligules 2-3 mm, glabrous, obtuse, lacerate; blades to 16 cm long, 1-6 mm wide, both surfaces softly hairy. Panicles 5-20 cm long, 3-8 cm wide, open, lax, drooping distally, usually 1-sided; branches 1-4 cm, drooping, usually 1-sided and longer than the spikelets, usually at least 1 branch with 4-8 spikelets. Spikelets 10-20 mm, usually shorter than the panicle branches, sides parallel or diverging distally, moderately laterally compressed, often purplish-tinged, not densely crowded, with 4-8 florets. Glumes villous, pubescent, or glabrous, margins hyaline; lower glumes 4-9 mm, 1-veined; upper glumes 7-13 mm, 3-5-veined; lemmas 9-12 mm, lanceolate, glabrous or pubescent to pilose, 5-7-veined, rounded over the midvein, margins hyaline, often with some hairs longer than those on the back, apices acuminate, hyaline, bifid, teeth 0.8-2(3) mm; awns 10-18 mm, straight, arising 1.5 mm or more below the lemma apices; anthers 0.5-1 mm. 2n = 14. 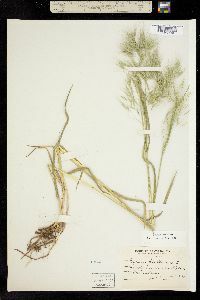 Bromus tectorum is a European species that is well established in the Flora region and other parts of the world. It grows in disturbed sites, such as overgrazed rangelands, fields, sand dunes, road verges, and waste places. It is highly competitive and dominates rapidly after fire, especially in sagebrush areas. The resulting dense, fine fuels permanently shorten the fire-return interval, further hindering reestablishment of native species. It now dominates large areas of the sagebrush ecosystem of the western Flora region. See Schachnet et al. 2008 discuss the population genetics of this species in the midcontinental United States and cite earlier papers on a similar topic for other parts of the country. 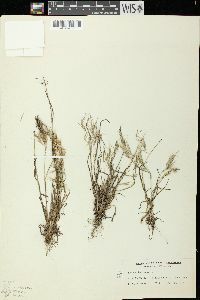 In the southwestern United States, Bromus tectorum is considered a good source of spring feed for cattle, at least until the awns mature. 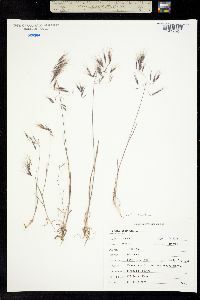 Specimens with glabrous spikelets have been called Bromus tectorum forma nudus (Klett & Richt.) H. St. John. They occur throughout the range of the species, and are not known to have any other distinguishing characteristics. For this reason, they are not given formal recognition in this treatment. Annuals, Terrestrial, not aquatic, Stems nodes swollen or brittle, Stems erect or ascending, Stems geniculate, decumbent, or lax, sometimes rooting at nodes, Stems solitary, Stems caespitose, tufted, or clustered, Stems terete, round in cross section, or polygonal, Stem internodes hollow, Stems with inflorescence less than 1 m tall, Stems, culms, or scapes exceeding basal leaves, Leaves mostly cauline, Leaves conspicuously 2-ranked, distichous, Leaves sheathing at base, Leaf sheath mostly closed, Leaf sheath hairy, hispid or prickly, Leaf sheath and blade differentiated, Leaf blades linear, Leaf blades very narrow or filiform, less than 2 mm wide, Leaf blades 2-10 mm wide, Leaf blades mostly flat, Leaf blades more or less hairy, Ligule present, Ligule an unfringed eciliate membrane, Inflorescence terminal, Inflorescence an open panicle, openly paniculate, branches spreading, Inflorescence a contracted panicle, narrowly paniculate, branches appressed or ascending, Inflorescence solitary, with 1 spike, fascicle, glomerule, head, or cluster per stem or culm, Inflorescence with 2-10 branches, Inflorescence branches more than 10 to numerous, Flowers bisexual, Spikelets pedicellate, Spikelets laterally compressed, Spikelets with 3-7 florets, Spikelets solitary at rachis nodes, Spikelets all alike and fertille, Spikelets bisexual, Spikelets disarticulating above the glumes, glumes persistent, Spikelets disarticulating beneath or between the florets, Rachilla or pedicel glabrous, Glumes present, empty bracts, Glumes 2 clearly present, Glumes equal or subequal, Glumes distinctly unequal, Glumes shorter than adjacent lemma, Glumes 1 nerved, Glumes 3 nerved, Lemmas thin, chartaceous, hyaline, cartilaginous, or membranous, Lemma 5-7 nerved, Lemma glabrous, Lemma body or surface hairy, Lemma apex dentate, 2-fid, Lemma distin ctly awned, more than 2-3 mm, Lemma with 1 awn, Lemma awn 1-2 cm long, Lemma awn 2-4 cm long or longer, Lemma awned from tip, Lemma awn from sinus of bifid apex, Lemma awn subapical or dorsal, Lemma awns straight or curved to base, Lemma margins thin, lying flat, Lemma straight, Palea present, well developed, Palea membranous, hyaline, Palea shorter than lemma, Palea 2 nerved or 2 keeled, Palea keels winged, scabrous, or ciliate, Stamens 3, Styles 2-fid, deeply 2-branched, Stigmas 2, Fruit - caryopsis, Caryopsis ellipsoid, longitudinally grooved, hilum long-linear, Caryopsis hairy at apex. This species is now found throughout the state and has become a pernicious weed in all the northern counties where a sandy soil is found. It is found along roadsides and in waste places, hayfields, pastures, and fallow fields. Common Name: cheatgrass Duration: Annual Nativity: Non-Native Lifeform: Graminoid General: Highly invasive annual grass, erect to spreading, 30-60 cm tall with a slender, unbranched stem and shallow roots. Sheath closed to within a few cm of ligule. 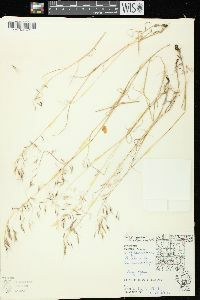 Culms puberulent below the panicles and sheaths densely and softly retrorsely pubescent to pilose. Vegetative: Blade 2.5-6 mm wide, 5-12 cm long, flat, twisted, drooping, blunt pointed; soft hairy on both sides; 2-3 veins each side of hairy midrib, which is prominent on upper leaf surface. Ligule thin and translucent, irregularly toothed or edges appear torn, 1-2. Inflorescence: Open panicle, dense, soft, drooping, often purple, 5-20 cm long, 3-8 cm wide, lax with spikelets 12-20 mm long, nodding, glumes subequal, lower glume 4-6 mm long, villous, upper 8-10 mm long, villous, lemma 10-12 mm long, lance-shaped, with long and soft hairs, teeth 2-3 mm long, convex on back, awn 12-14 mm long, straight to twisted. Ecology: Widespread on roadsides and open waste ground, a weedy plant of overgrazed lands from 4,000-8,000 ft (1220-2440 m); flowers May-September. Distribution: Native to Eurasia and north Africa. Naturalized in Southern Africa, Australia, and north and South America. Found in every state in the US; it is especially abundant in the rangelands of the American West. 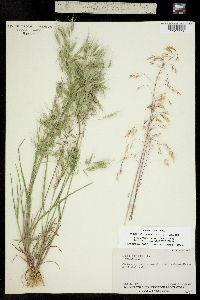 Notes: Slender annual grass with an open panicle; the branches are flexuous so groups of spikelets often hang and droop, especially once the plant is dried out; the spikelets are not flattened; awns are 1-2 cm long and spreading or curling as the plant dries out; sheaths are closed and the ligule is thin and scarious with a jagged edge; Like other annual bromes, the plant is woolly (soft to touch) with early spring growth; at maturity it has a purplish-brown inflorescence with relatively long awns. A weed of disturbed and overgrazed ground, it is not easily confused with other grasses, especially with its nodding inflorescence when mature. Sterile young grasses look like other annual Bromus species, with slender stems and pubescent sheaths. Ethnobotany: Used in religions ceremonies by the Kayenta Navajo, and as a fiber for mats, rugs and bedding by the Oregon Paiutes. The seeds were eaten by the Cahuilla in times of famine, and the Ramah Navajo used it as fodder for their sheep and horses. 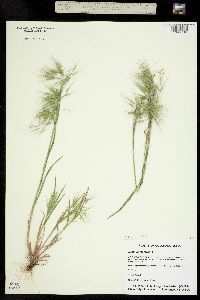 Synonyms: Anisantha tectorum, Bromus tectorum var. 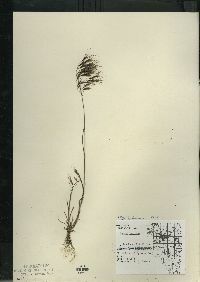 tectorum, Bromus tectorum var. 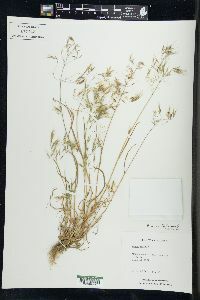 glabratus, Bromus tectorum var. 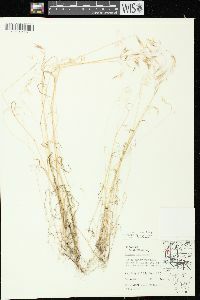 hirsutus, Bromus tectorum var. nudus Editor: SBuckley 2010, FSCoburn 2015, AHazelton 2015 Etymology: Bromus is from Greek bromo, for oats, while tectorum is Latin, meaning "of the roof." Annual 2-7 dm; sheaths and blades soft-hairy, the latter 2-4 mm wide; ligule 1-2.5(-4) mm; infl 1-2 dm, often nodding, repeatedly but rather openly branched, bearing somewhat crowded, mostly drooping, 3-8-fld spikelets to 2(-3.5) cm on slender pedicels; glumes subulate, the first 5-7 mm, 1-veined, the second 8-11 mm, 3-veined; lemmas narrowly lanceolate, 8-12(-15) mm, evidently hairy or seldom glabrous, 1-1.5 mm wide in side-view, 5-7-veined, acuminate into slender scarious teeth 1-3 mm; awns (7-)10-17 mm; palea shorter than the lemma; anthers 0.5-0.7 mm; 2n=14. Native of Europe, now a common weed nearly throughout the U.S., esp. westward.